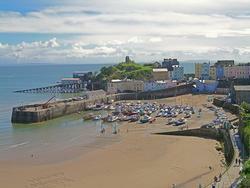 The picturesque harbour at Tenby. Pembrokeshire is the most westerly of all of the counties in Wales. It is also home to the only coastal national park in the United Kingdom. As such, Pembrokeshire offers a wealth of outdoor activities that can be enjoyed in some of the most beautiful landscapes in Great Britain. From horse riding to golf, from fishing to exploring castles and from walking the miles of coast path to more extreme pursuits, there is something here to suit everyone. Besides enjoying the beaches of the south, west and north coast of Pembrokeshire there are pleanty of things to do. A large number of events and festivals take place throught the year in many of the towns and villages in the county. There are also many museums, gardens and family activities open to the public. With Pembrokeshire being such a popular tourist destination there is a large range of accommodation options to suit all budgets and requirements. Options range from grand hotels to humble camp sites and everything in between, including accommodation for those who want to bring their dogs on holiday with them. There is a broad range of entertainment options in the county, including: cinemas, theatres, theme parks, gyms and spas. So even if the weather is not playing nicely, you can find plenty to enjoy during your time in Pembrokeshire!